Economix : Global Economic Challenges is an annual international event held by KANOPI FEB UI, a student organization run by undergraduate economics students at the Faculty of Economics and Business, Universitas Indonesia. Our event aims to be the medium for participants of diverse backgrounds and disciplines to share, discuss, and find potential solutions to current global economic issues. Moreover, Economix embraces these various world cultures and hosts additional casual events to facilitate an enriched cultural exchange. Participants from countries all over the globe can take part in our three main events : International Seminar, Competition, and Economix-MUN. Participants can also take part in our mini event called Mini Essay. 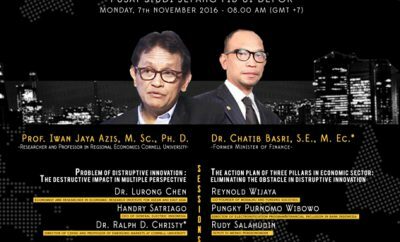 The 15th Economix International Seminar is the opening agenda for the 15th Economix series of events. The grand theme of 15th Economix International Seminar is “The Resurgence of Neo-Protectionism: A Changing World”, in which we raise the discussion and questions about a changing world towards neo-protectionism era. The 15th Economix International Seminar consists of 3 sessions – 1 keynote session and 2 seminar sessions. In each session, 15th Economix committee will invite competent and renowned speakers from different countries to discuss the issues about The Resurgence of Neo-Protectionism. The keynote session will discuss a subtheme of “The Disruptive Revival of Neo-Protectionism on Global Trade Dynamics”. This session will present a general overview about neo-protectionism, how it will affect the global trade dynamics and elaborate the urgency of the possible ill-effects of neo-protectionism for the global environment. Then, the first seminar session will raise a subtheme of “Regional Perspective on the Challenges and Opportunities of Neo-Protectionism”. This session will elaborate how neo-protectionism will affect the region of Southeast Asia, its economic opportunities and trade relationship with other regions, as well as the policy recommendations for Southeast Asian countries to thrive under neo-protectionism. Lastly, the 15th Economix International Seminar will be closed by the second seminar session discussing a subtheme of “Industrial Behavior in Response to the Threat of Neo-Protectionism”. This final session will elaborate the impacts of neo-protectionism towards manufacturing and service industries. The 15th Economix: Global Economic Challenges promotes “The Resurgence of Neo-Protectionism: A Changing World” as this year competition’s grand theme. Participants will have to observe the economic phenomena caused of the practice of protectionism that has currently re-emerged in some part of the world. 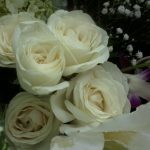 Those economic phenomena could be obstacles or opportunities for global economy. Therefore participants have to elaborate the things related to protectionism, give the solution to problems, and propose a way to utilize the opportunities of the protectionism. The participants’ knowledge, ability to elaborate problems and solutions will be observed by the judges. 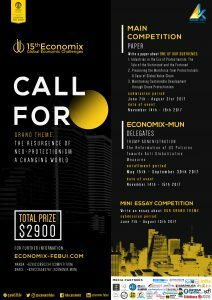 Economix MUN or Model United Nations¬¬ is one of the main events of the 15th Economix: Global Economic Challenges. Previously named E-MUNC (Economix Model United Nations Conference) is changed into Economix MUN for rebranding purposes to minimize any misunderstanding amongst potential delegates regarding the topic of the discussion. The name Economix MUN is therefore aimed to increase the number of delegates. This year, Economix MUN will be held on 14-15 November 2017. 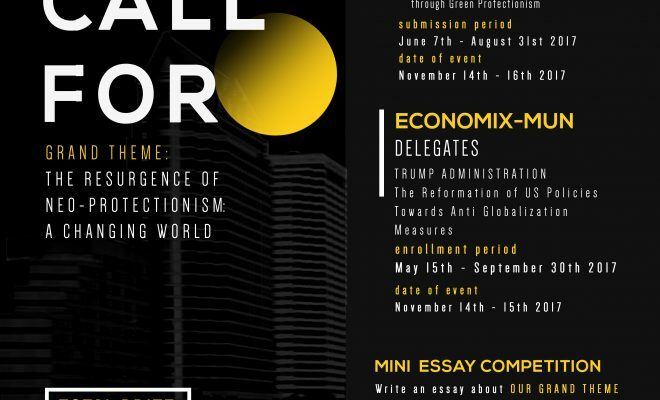 With this year’s grand theme “The Resurgence of Neo-Protectionism: A Changing World”, Economix MUN raises the theme of “Trump Administration: The Reformation of US Policies towards Anti-Globalization Measures”. With this socio-political theme, we cordially welcome all participants from all majors and not only limited to economics.